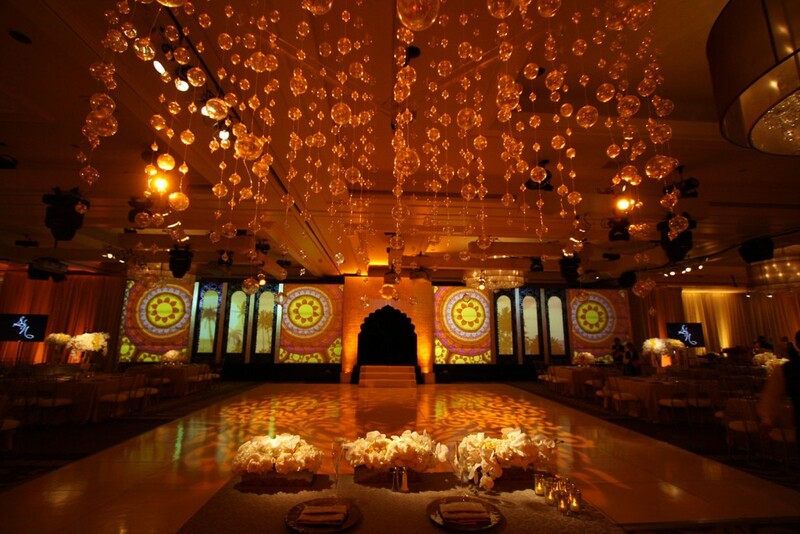 This amazing Indian wedding married Hindu traditions with modern technology. 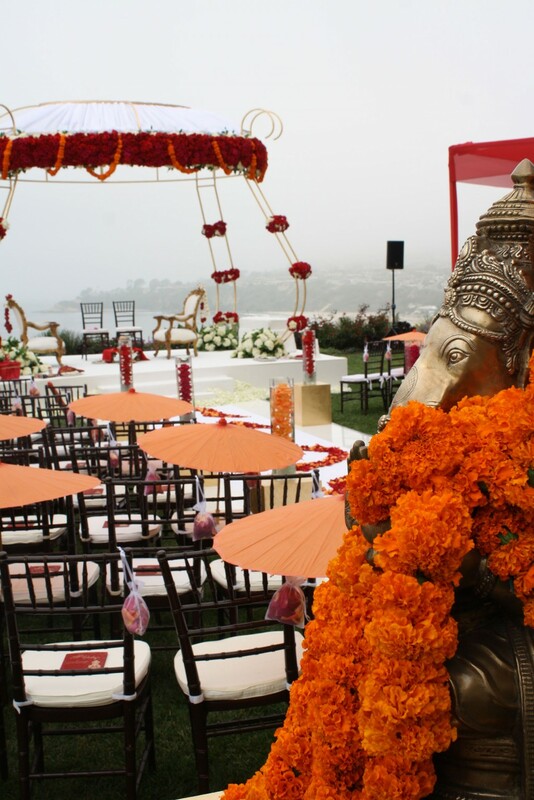 Tradition prevailed with a colorful Indian rehearsal dinner, a lively processional to introduce the two families, and an elaborate ceremonial wedding overlooking the ocean. East merged with West at a reception that included a live theatrical production complete with digital mapping, video projection, music, and scenes! 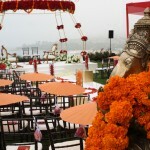 This simply amazing two-day Indian wedding intertwined Hindu traditions with modern technology for a contemporary couple. 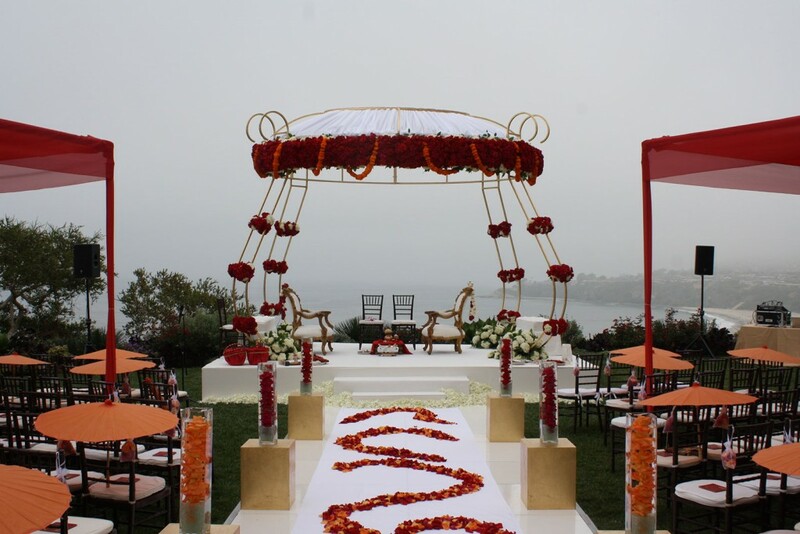 Sapna and Nikhil celebrated with their families and 360 guests at the Ritz Carlton in Laguna Nigel, California. 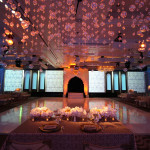 The series of wedding events that took place were designed to reflect the couple’s style and to celebrate their heritage. 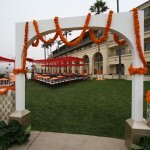 A Sangeet, or Indian rehearsal dinner, kicked off the two-day celebration. 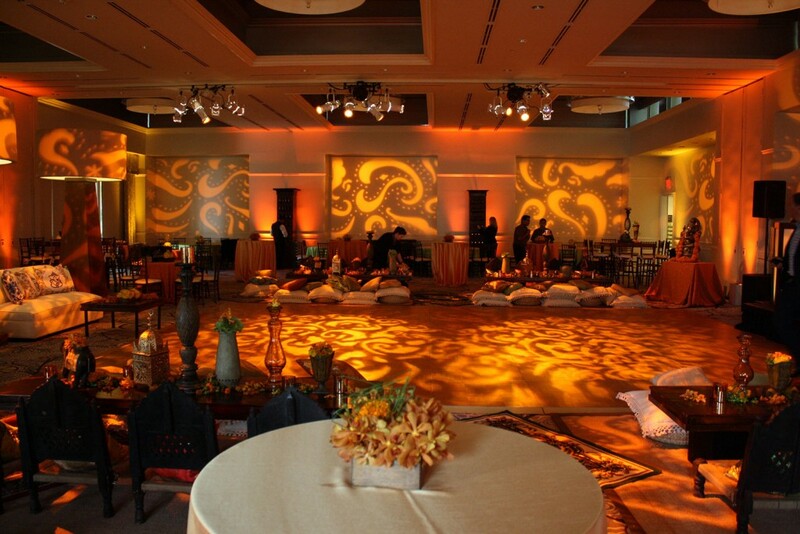 Not the usual rehearsal dinner and filled with significant ceremony, the Sangeet was choreographed to include skits, songs, and dancing performed by family members and friends. 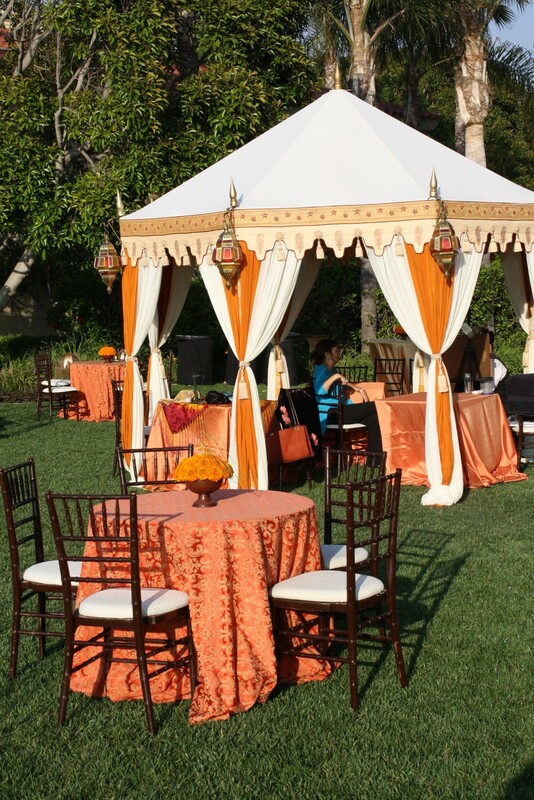 An Indian style, ivory-topped tent, draped in pale orange and gold colors greeted guests on the Sunset Terrace. 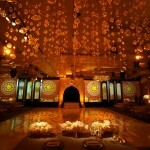 Custom gold Indian lanterns hung from each section of the tent’s crown and glistened in the waning light. Tattoo artists and tealeaf readers delighted guests inside while cocktails and hors d’oeuvres were served around its perimeter. 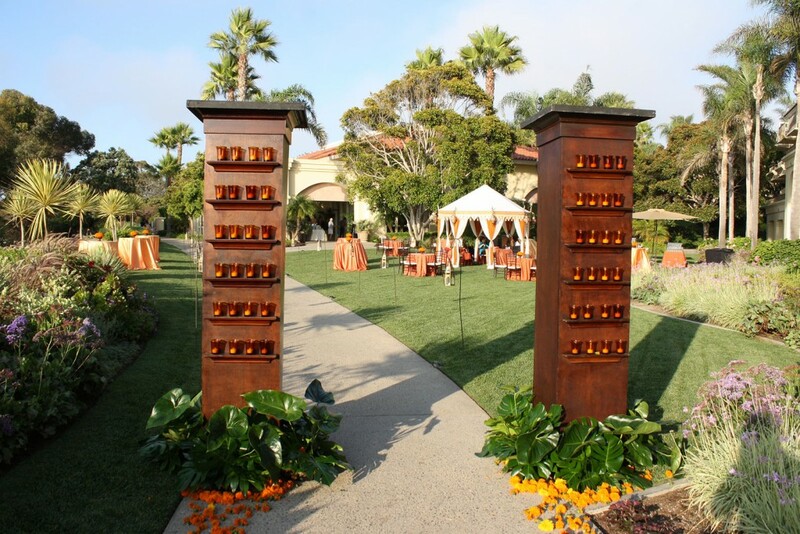 Cocktail tables covered with orange and gold damask tablecloths, topped with marigolds, offered guests a place to mingle before following the walkway, lined on either side with the familiar lanterns. 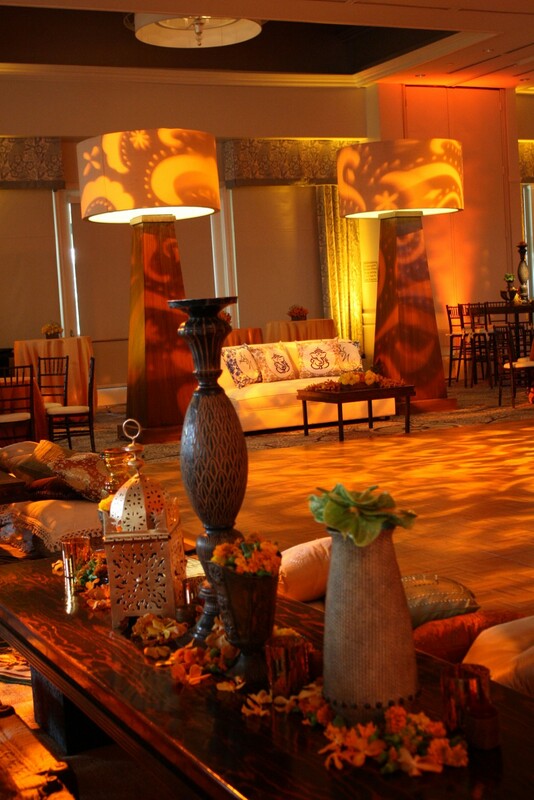 A breathtaking entrance of mahogany, infused with ivory, orange and gold hues, glowed in the lanterns’ light. 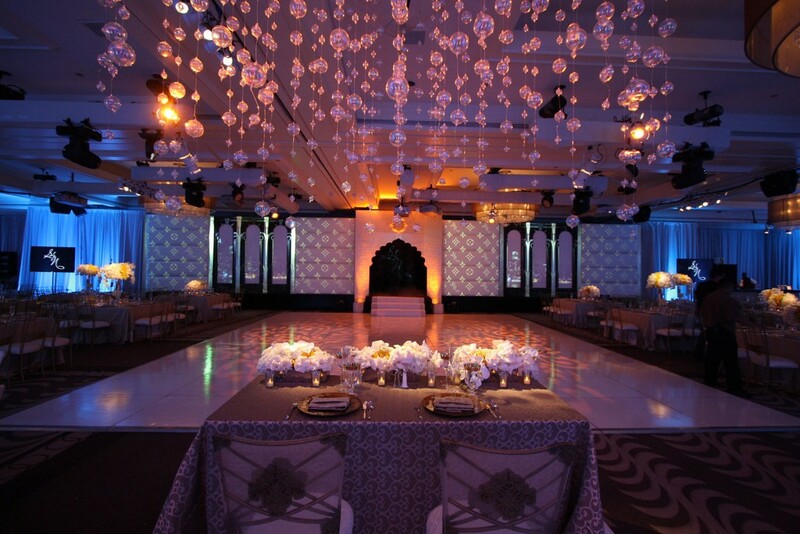 Long buffets, bathed in marigold hues, lined the breezeway from entrance to ballroom, loaded with delicacies prepared by a Ritz Carlton Indian cuisine specialist flown in just for the occasion. 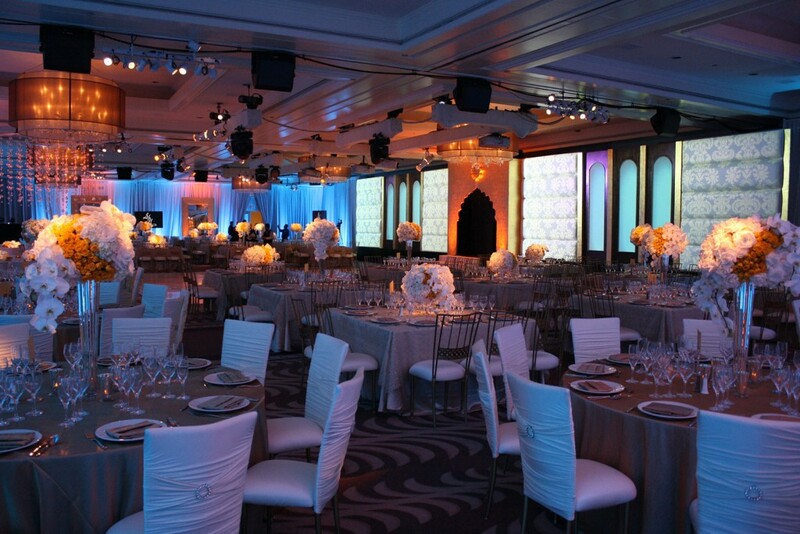 To everyone’s delight, the ballroom’s centerpiece revealed a customized area for the bride and groom to dine and revel in the entertainment. 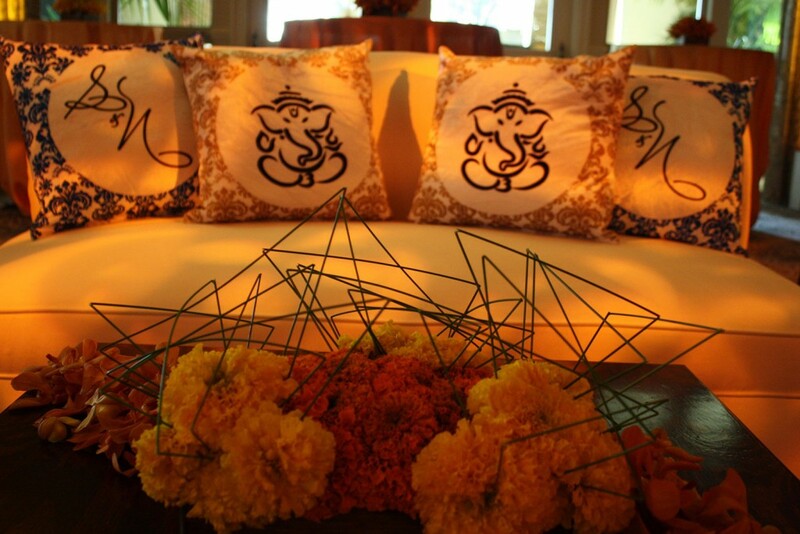 An ivory Damask sofa featured customized pillows embroidered with the couples’ initials (S&N) and the Hindu Elephant God, Ganesha, prevalent in the Hindu religion. 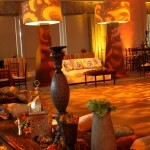 (The wedding invitation design and logo on the pillows were a common thread throughout the wedding event design). Two giant mahogany lamps anchored the area. 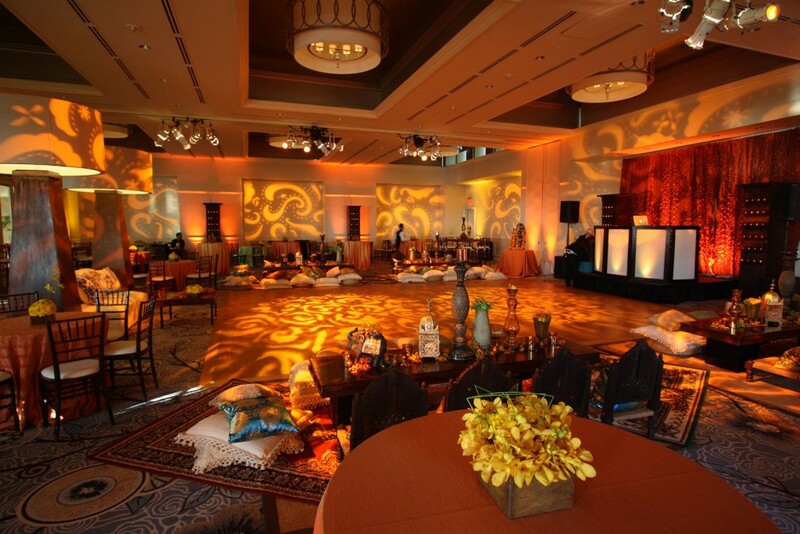 Paisley patterns projected onto the lampshades and floor, while perimeter lighting washed the walls in changing colors anchored with marigold. 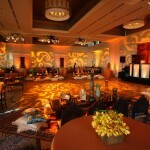 A DJ played contemporary Indian music and served as MC throughout each event. 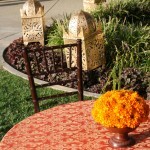 Indian chairs surrounded low tables draped with orange and gold floor length linens. 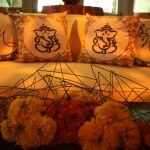 Hand carved elephants and tin hammered containers overflowed with marigolds and orange orchids. Brightly colored floor pillows were interspersed with tables, which were tiered so that every guest had a clear view of the festivities. After dinner, songs, dances and stories about the couple and their families, coordinated and choreographed by the groom’s family, delighted all for hours. Dancing until the wee hours followed. 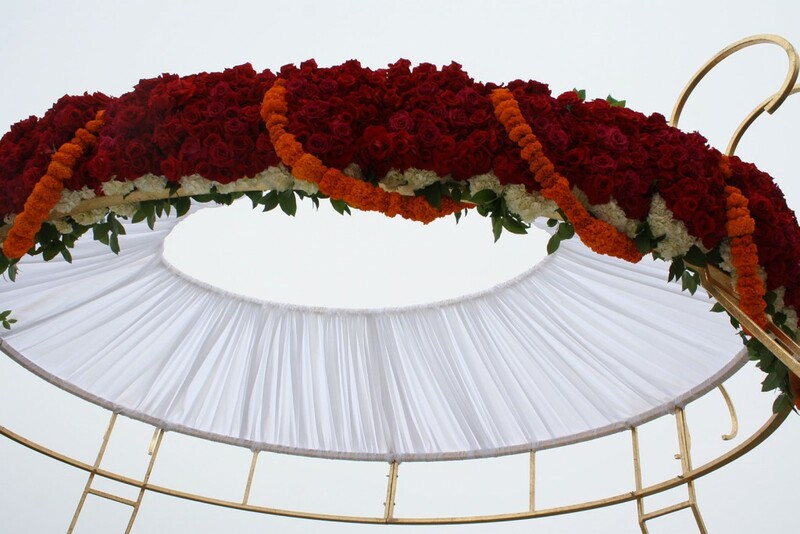 The next morning, a lively processional carried the groom (wearing a ceremonial garland of red spray roses on a horse drawn chariot, dripping with 150 feet of strung marigolds. He was surrounded by friends and relatives. 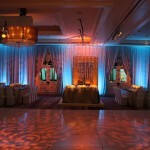 Our DJ in a mobile booth led the way as wedding guests danced around him banging loud percussion instruments. The celebration led to the introduction of the two families. 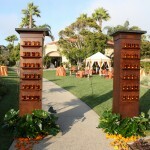 Another fun-filled procession led them to the wedding venue. The bride, carrying an all white bouquet of roses, mini calla lilies, and stephanotis, was dressed in a red and ivory sari with a flowing red veil. 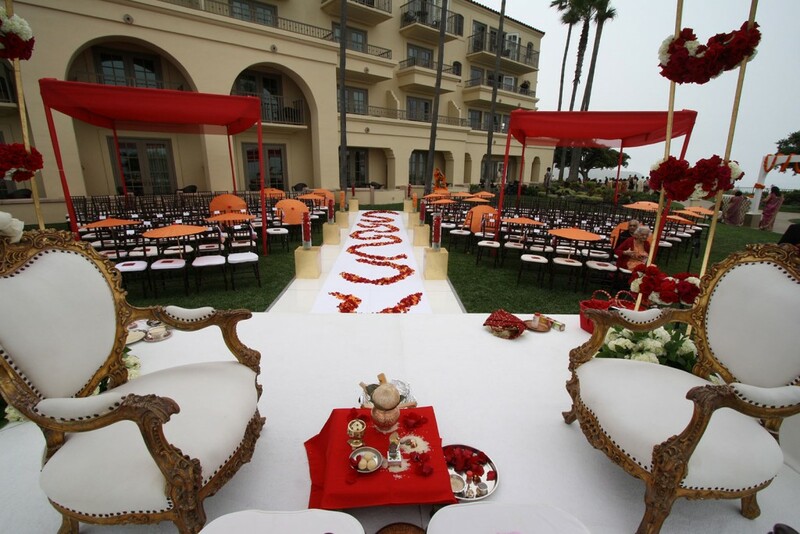 The Groom wore a red turban and a white safa. 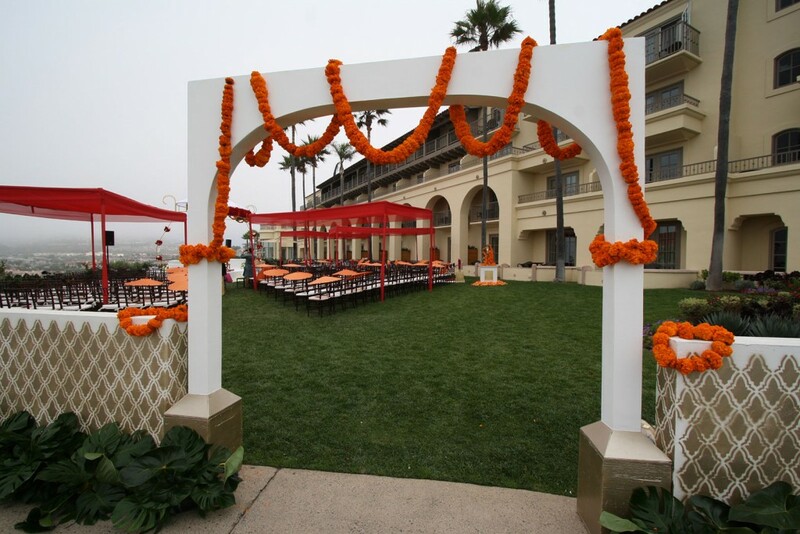 Guests entered the ceremony space through a custom made white arch, decorated with marigold garlands and surrounded by two gold patterned walls. 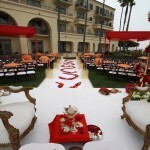 Four sheer red canopies shaded guests as they sat in mahogany chiavari chairs. 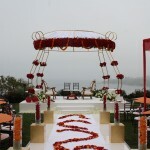 The ceremony was held under an elaborate, custom-built mandap, standing 12 foot by 12 foot square and approximately 12 feet tall. 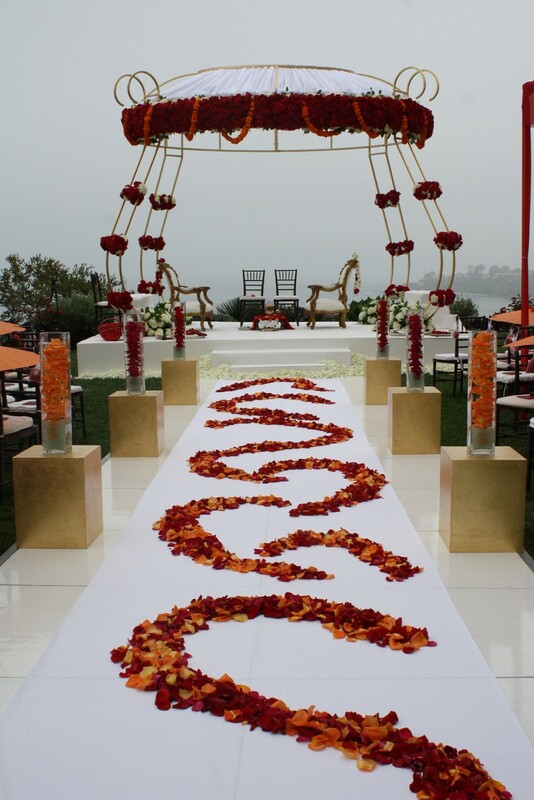 Decorated with gold leafing, it was crowned in white fabric, embellished with 6,000 hand opened red and fuschia roses and accented with white hydrangeas and orange marigold garlands. 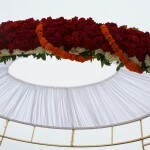 The structure base and sides of the steps were covered with 1,000 Dendrobian roses. 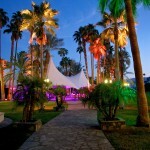 The wedding aisle was created by placing an eight foot wide white dance floor on the grass. 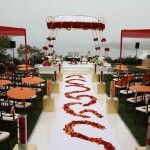 The aisle featured red, fuschia and orange rose petals in a flowing design. 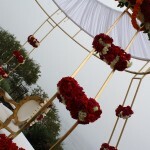 Ivory chairs with gold embellishment, decorated with yellow, fuschia and orange rose petals, provided mandap seating for the couple. 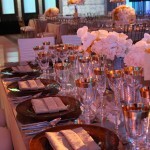 Gold leaf box bases holding square glass containers filled with orange, pink or red rose garlands (all opened by hand floating in water, lined both sides of the aisle. 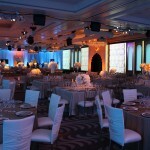 Both contemporary music from a white Baby Grand piano and Indian music from our DJ provided ambience. 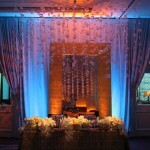 The visual background: the Pacific Ocean and a flawless blue sky… Magnificent! 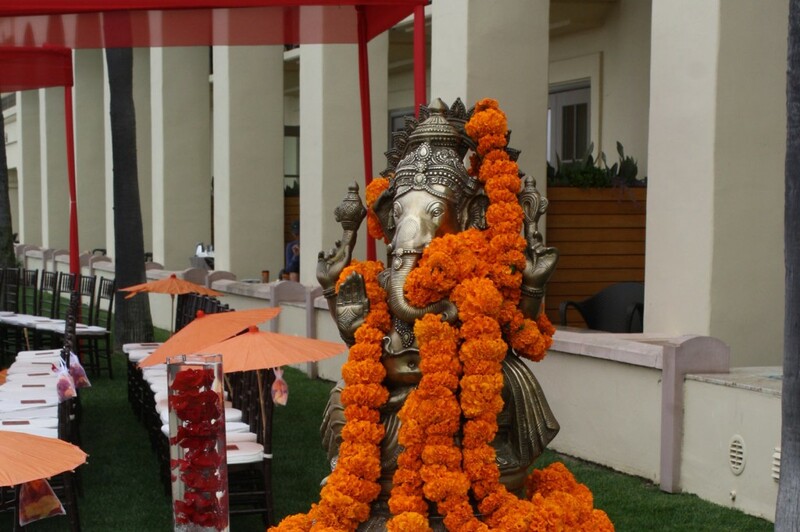 Ganesha, the elephant God revered in India as the Remover of Obstacles and Lord of Beginnings, guarded the entrance to the bride’s walkway. 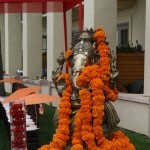 Adorned by 60 feet of marigold garlands, a golden Ganesha sat on a gold leaf platform. A lovely Damask gift book, detailing the meaning behind each traditional activity, allowed guests to follow the Hindu wedding ceremony. After taking a few hours to relax, guests gathered on the Sunset Terrace. A strolling musician created soothing contemporary music with an amplified, wireless electric violin. 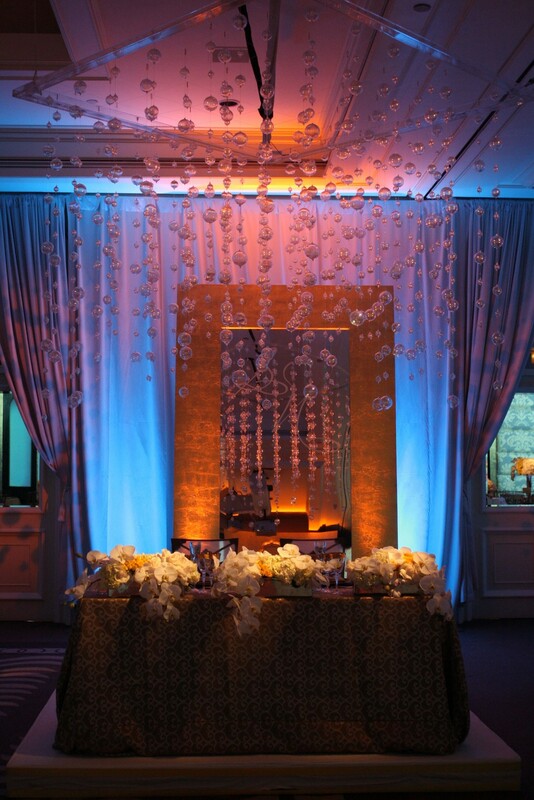 A custom 12′ bar was fashioned in gold and ivory Damask to match the bars inside. A martini luge ice sculpture displayed the couple’s initials and the New York skyline, signifying where they met and fell in love. 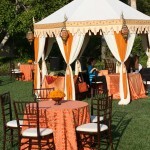 Cocktail tables carried the marigold theme. 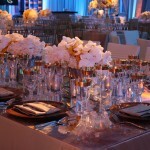 In the foyer, yellow spray roses hung over the guest book table, giving it a fresh look. 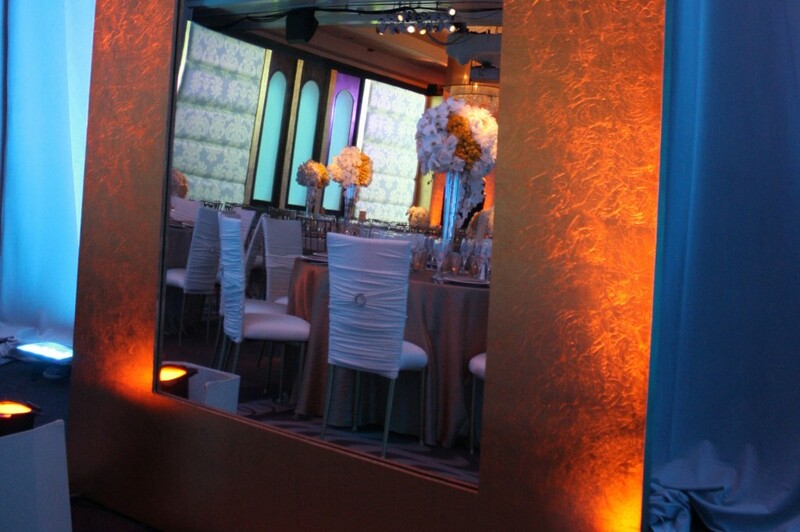 Ballroom doors opened to reveal a breathtaking room and custom built set of a gold leaf and mahogany arch flanked by Damask “windowed” walls. 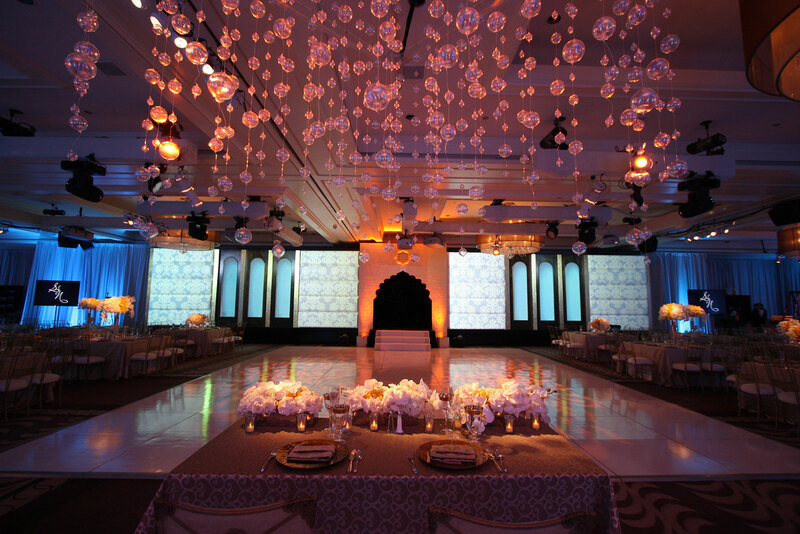 Adding to the opulence of the room, we created 12 digitally mapped scenes on our scenic walls completely choreographed to tell the story of the couple and their families. 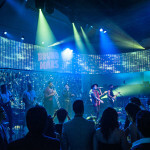 The reception was a theatrical production, with digital mapping, video projection, music, sound effects, lighting, and scenes, all coordinated as a live show. At the introduction of our bride and groom, the wallpaper morphed into a custom Louis Vuitton pattern around the couple’s initials, their signature logo for the evening. The set windows streamed video of the NYC skyline. But wait−a special reveal! 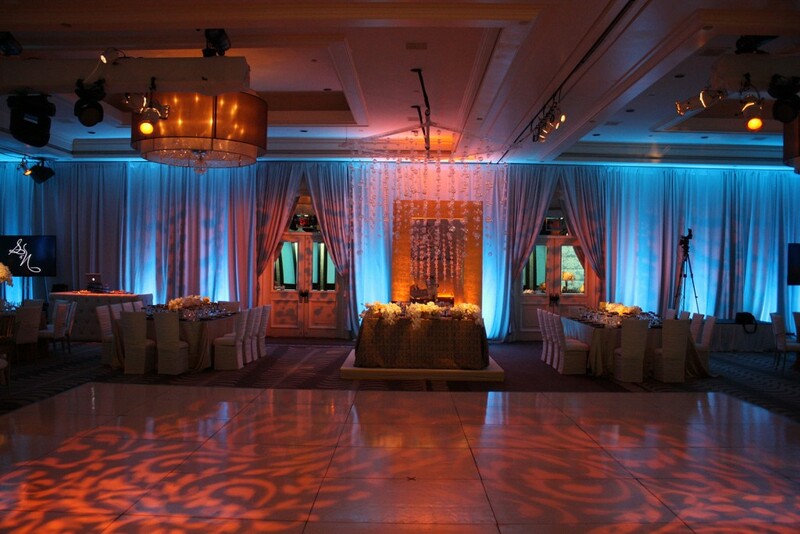 A hidden fog wall inside the arch projected the couple’s initials. Right before the reveal, a three-minute tribute video summarized the past days’ events on the windows and screens around the room. All eyes followed around the room and then to the arch. Suddenly, the couple appeared through the fog and onto the set as applause erupted! Oh, but there was so much more! Each scene was digitally mapped. Ten more “scenes” follow. 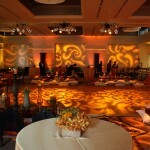 Two truly touching moments were the father daughter and mother son dances. Both walls turned paisley as a baby elephant in the left window and its mother in the right window appeared on split screen and then came together as the baby latched onto its mother’s tail with its trunk while parent and child danced. 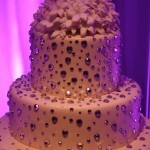 Another scene featured the cake cutting with video fireworks in the windows. 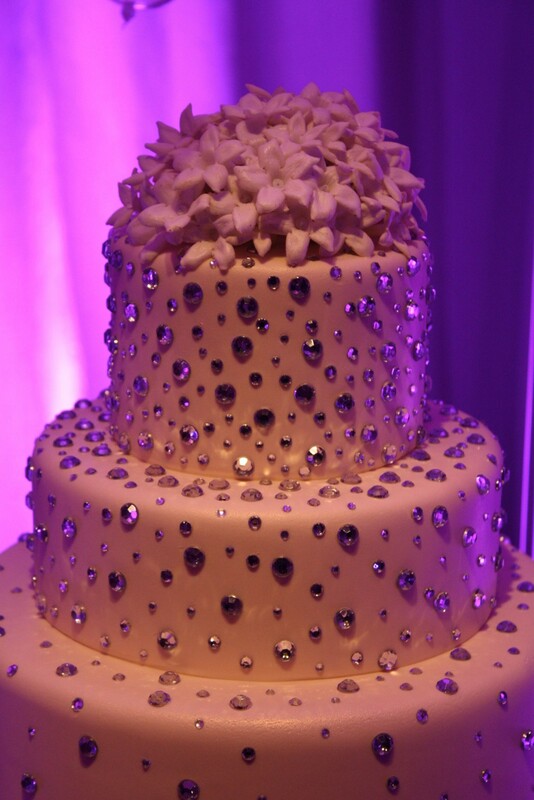 The cake cutting involved a custom-built floating rhinestone and stephanotis encrusted cake on a gold leaf table that had been hanging overhead with a “Bubble” chandelier! Our Indian MC kept the “show” moving along with our two camera IMAG full production team projecting every moment on screens around the room. 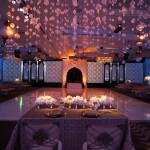 Changing patterns spread across the white dance floor. 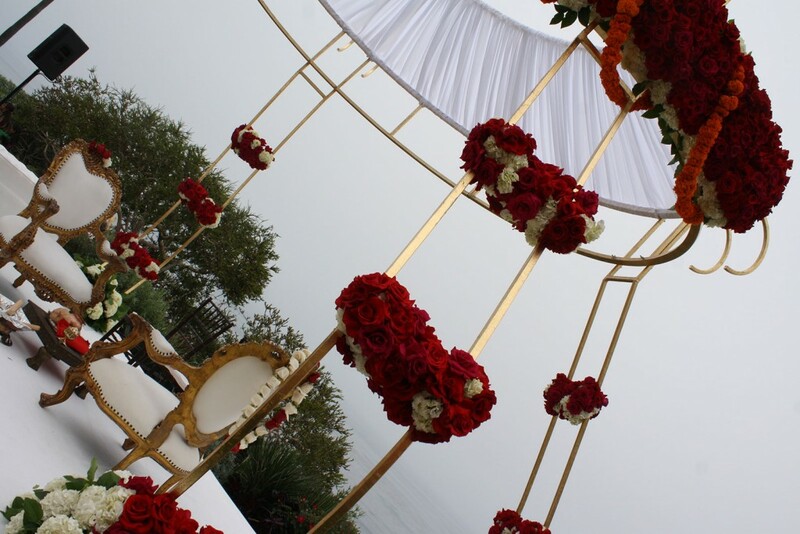 The Sweetheart table, topped with flowers and Valentino linens of Indian loop patterns, sat opposite the arch on a custom raised white platform overhung with another bubble chandelier. 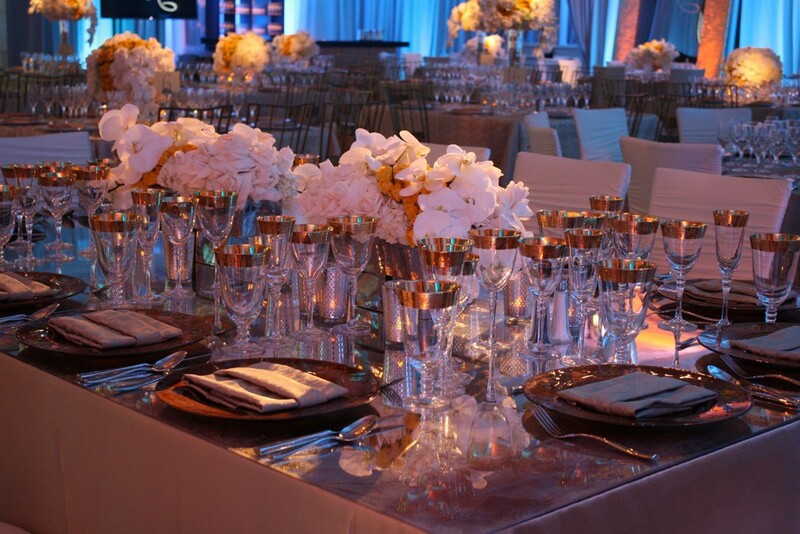 Chairs were covered with organza sheer taupe medallion sleeves. 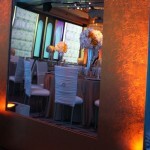 Oversized gold leaf mirrors with S&N initials hugged the perimeter. 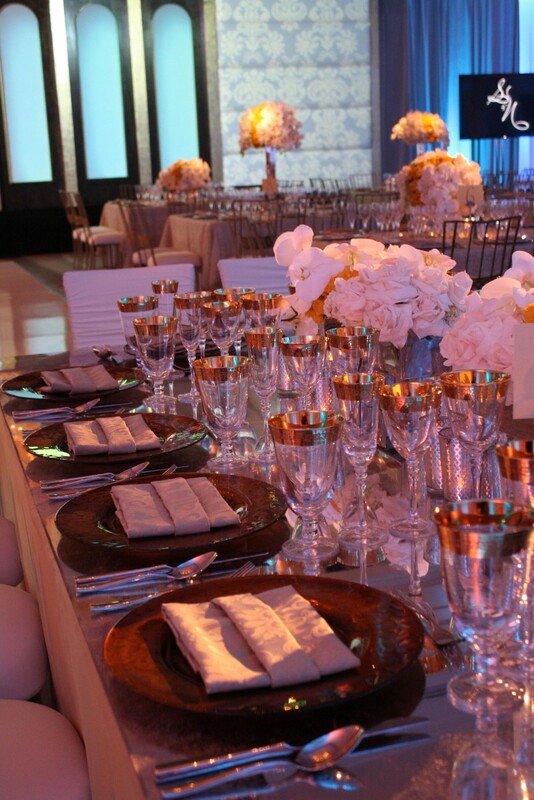 The two families sat at king’s tables with antique tops displaying gold chargers and gold rimware. 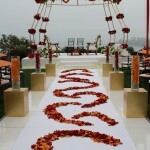 Positioned on either side of the Sweetheart table, they surrounded the couple with love and support. 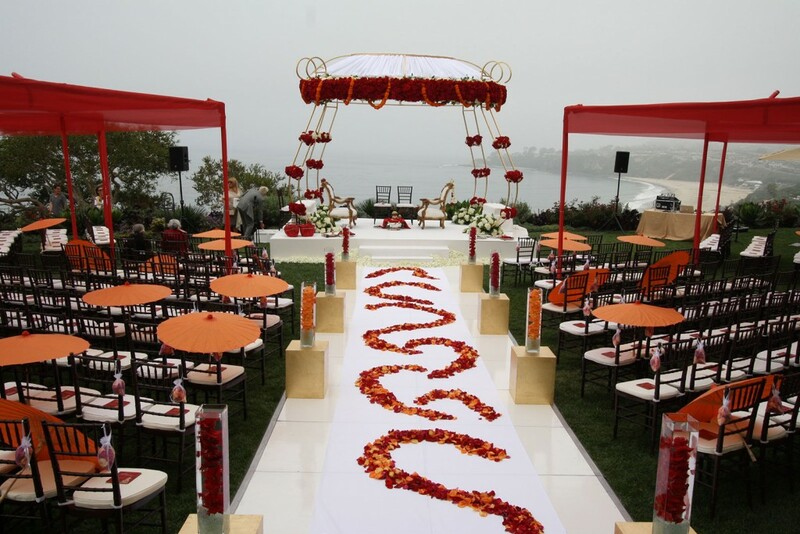 Square and round guest tables were topped with white orchids and roses, accented with smaller bright yellow roses and Dendrobium orchid buds to create a sari band. All were arranged below or above eye level and pinspotted. 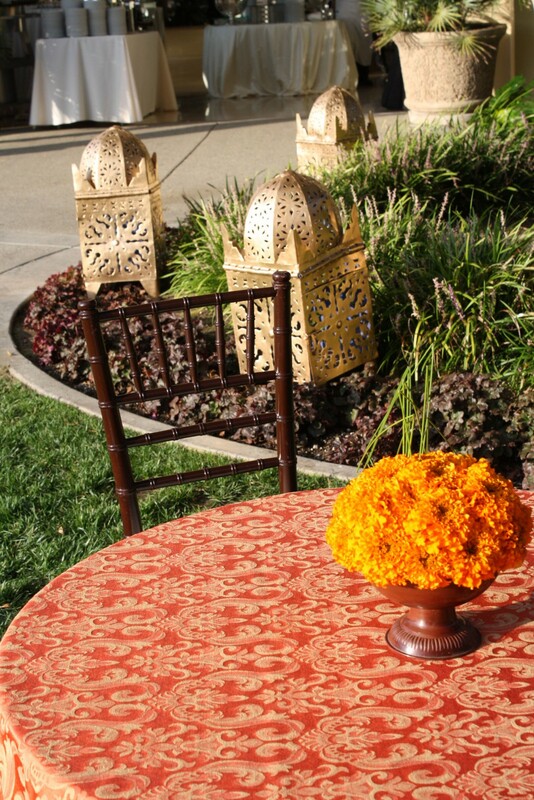 Vermillion chairs were designed with complementing colors of champagne and gold lace. After our live theatrical production and Indian specialty dinner, the room morphed into a NYC nightclub with geometric shapes moving and changing with music all night!